​Many of the insects we have discussed previously are trying to fool their predators into thinking they are dangerous. Some are colored like insects that sting or bite, some have bright colors to warn predators to keep away, some try to look bigger by puffing up their bodies or rearing up, or have eyespots that make them look bigger or scarier. All these defense mechanisms make them seem what they are not – dangerous. 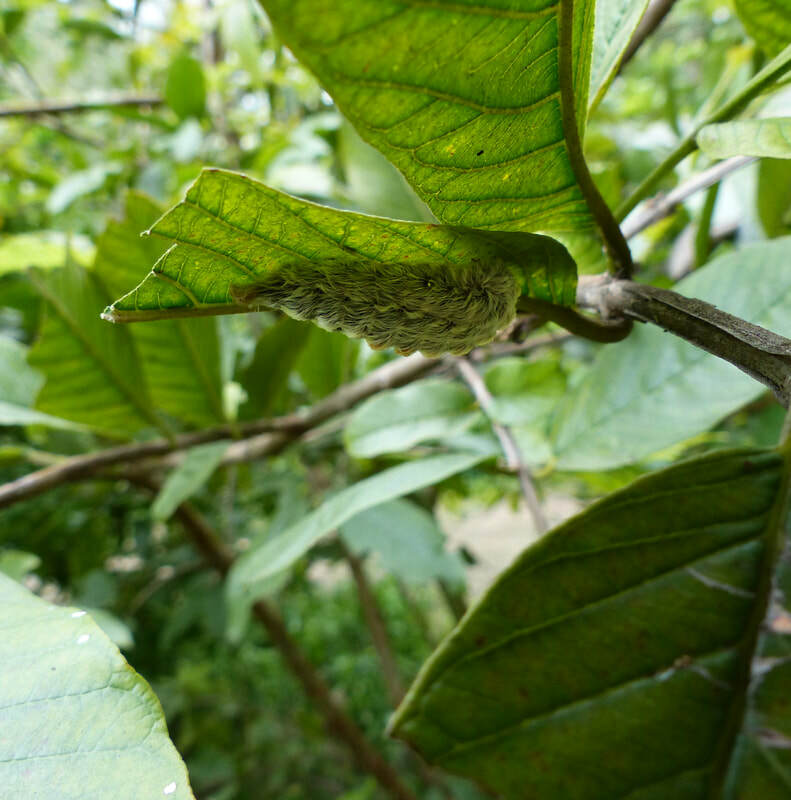 In the following section, you will discover a variety of caterpillars that are not trying to appear dangerous – they are! They have hairs or spines that are hollow, and when they are brushed against, release toxins that can cause irritation or pain. A mouthful of stinging hairs is probably enough to teach predators which caterpillars to avoid. These are caterpillars YOU also need to avoid! Depending on your sensitivity, they may cause pain, rashes, itching, swelling, or even, in some cases, hospitalization — or no reaction. Since it is not clear how one will react, my advice is to avoid touching any caterpillar with hairs or spines. 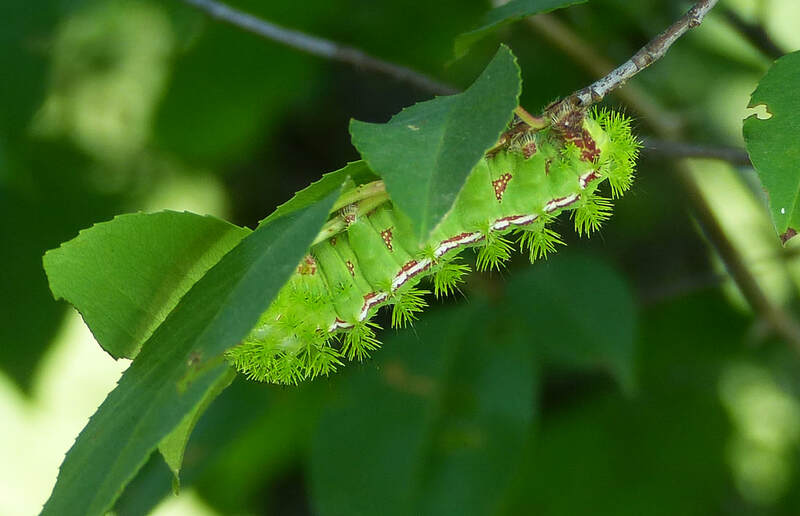 Since the caterpillars below are not the only "dangerous" caterpillars with venomous spines -- they are only the ones I have seen and photographed -- the safest policy is to avoid touching any caterpillar, particularly ones with hairs or spines. Puss Caterpillars, or Southern Flannel Moth Caterpillars, also known as Asps, have long, fine, silky hairs that make you want to pet them. A Puss looks so soft. But beware! The Puss is one of the most dangerous of all of the dangerous caterpillars. Under the irresistible hairs lurk spines that are attached to poison glands. The spines break off and lodge in the skin of any creature that brushes against them. These toxins can cause intense pain and a rash, as well as swollen glands, nausea, and vomiting. Not everyone will have a serious reaction, but it certainly is not worth taking a chance. The hairs of the Puss are often compared to a wig. I once saw a man in a hotel with blond hair that looked exactly like a very large Puss (Puss are sometimes blond) was sitting on his head. I didn't think he would have been too happy for me to have pointed out this similarity! To me, Puss Caterpillars look like they are covered with a blanket that they carry around on their body. You can see the Puss head on the left peaking out as it chews on a green leaf. The first line of defense of any venomous caterpillar is NOT attacking a predator. It uses camouflage or warning colors or playing dead as a first resort. Below, you see how well-camouflaged the Puss is as it hides under the leaf to avoid predation. 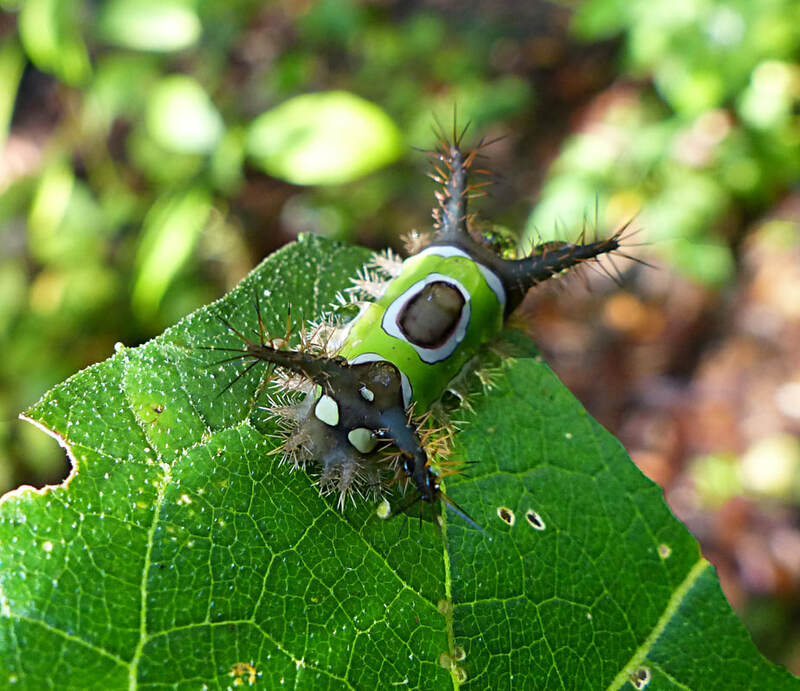 ​I know it is not scientific to describe Saddleback Caterpillars as cute, but they are. They look like they are wearing a bright green saddle blanket on their backs as they jauntily glide along. They are Slug Caterpillars. Most caterpillars have six real legs situated near their heads. Then, along their bodies, to help grasp and propel them, they have five pairs of prolegs. Slugs have no prolegs, so they glide along like an army tank. They move like slugs. But don’t get enchanted by this cute little thing covered with jaunty spines. The many spines jutting from the Saddleback’s body are extremely dangerous. In fact, Saddlebacks are one of the most dangerous U.S. caterpillars. When embedded in tissue, their long, pointed hollow spines can inject venom, which causes intense pain and very serious health conditions. We once talked to a gardener who described a Saddleback’s brush against his face as feeling like a knife had sliced his cheek. ​Despite the effectiveness of its spines, Saddleback do not want to encounter a predator’s attack. They often hide under a leaf, and the bright white eyespots you see on the caterpillar’s posterior below are meant to startle and frighten predators away. 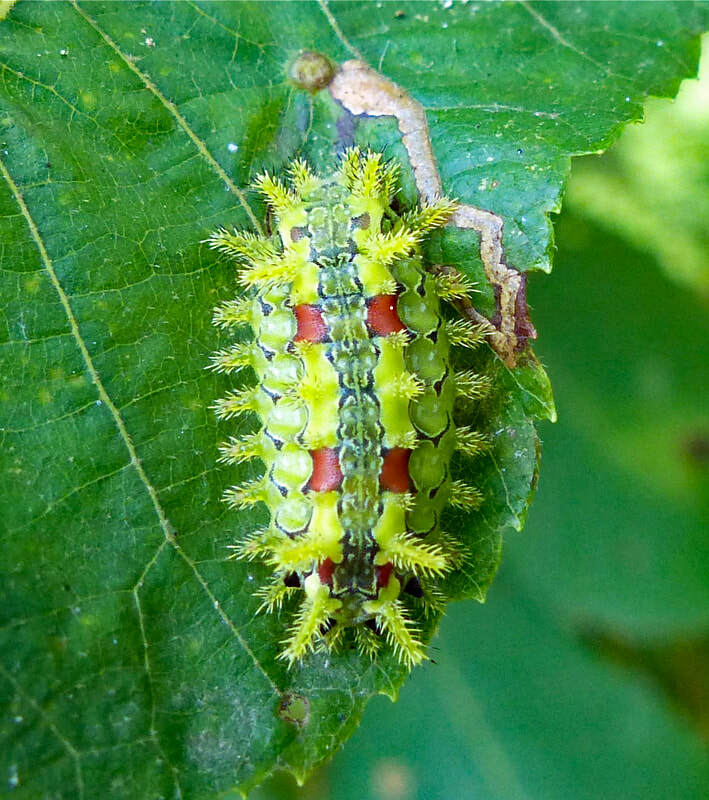 ​Another Slug Caterpillar that may cause pain or itching is the Hag Moth Caterpillar, also known as a Monkey Slug. It looks a bit like Daniel Boone’s raccoon hat, and some people describe it as resembling a tarantula. It has six pairs of hairy, curly projections that can cause irritation if you are sensitive to its poisons. 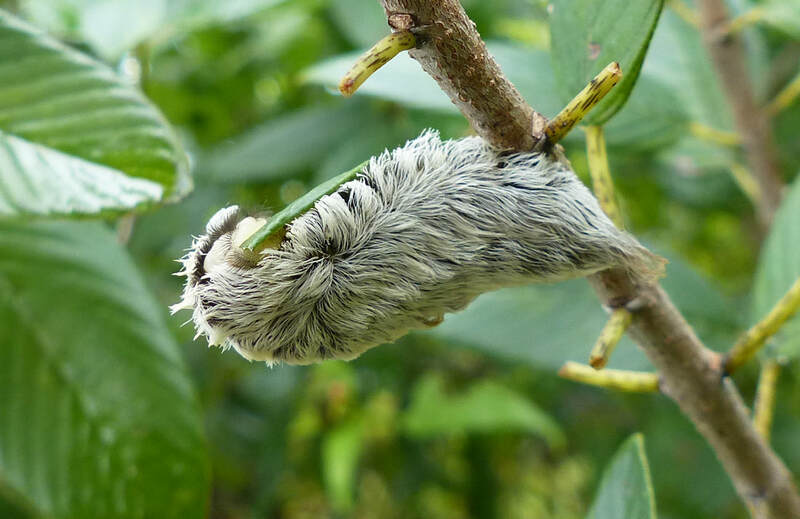 Because the arms fall off without harm to the caterpillar, attacking predators may be rewarded with a hairy projection instead of a juicy caterpillar. The 12 curly, hairy projections of the Hag Moth Caterpillar (Phobetron pithecium) are easier to see in this photo. 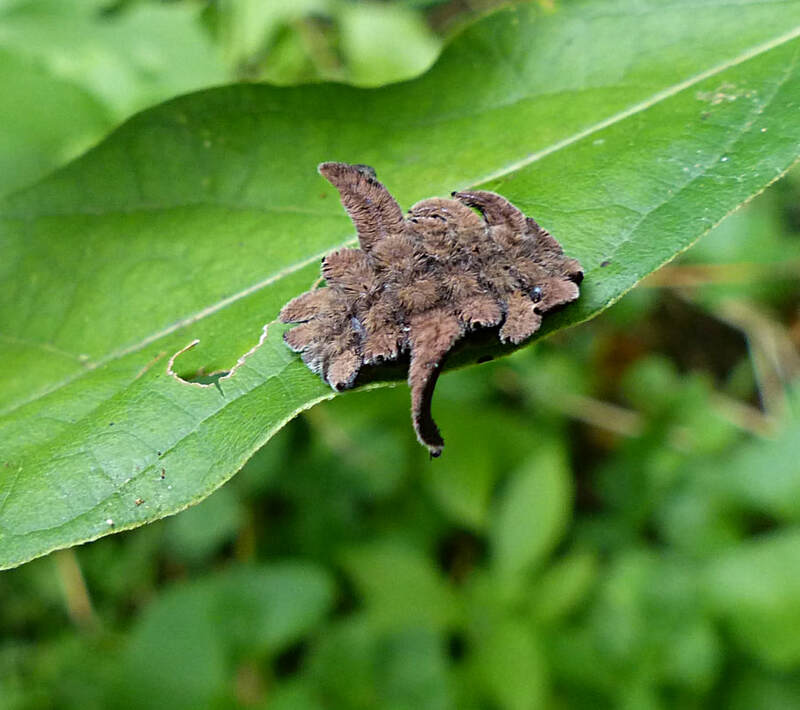 Another slug caterpillar that stings is the Spiny-Oak Slug. However, the poison is much less potent than that of the Saddleback Caterpillar. The bright red markings are a warning that the toxin could cause irritation and pain to predators as well as you! Spiny Oak Slug (Euclea delphinii) has tubercules and spines that transport toxin from the caterpillar's poison glands. The many spines on Io Moth Caterpillars may make predators reluctant to attack them. The spines are connected to poison glands that may cause harm. Humans, sensitive to the poison, may react with burning or itching lasting for several hours. 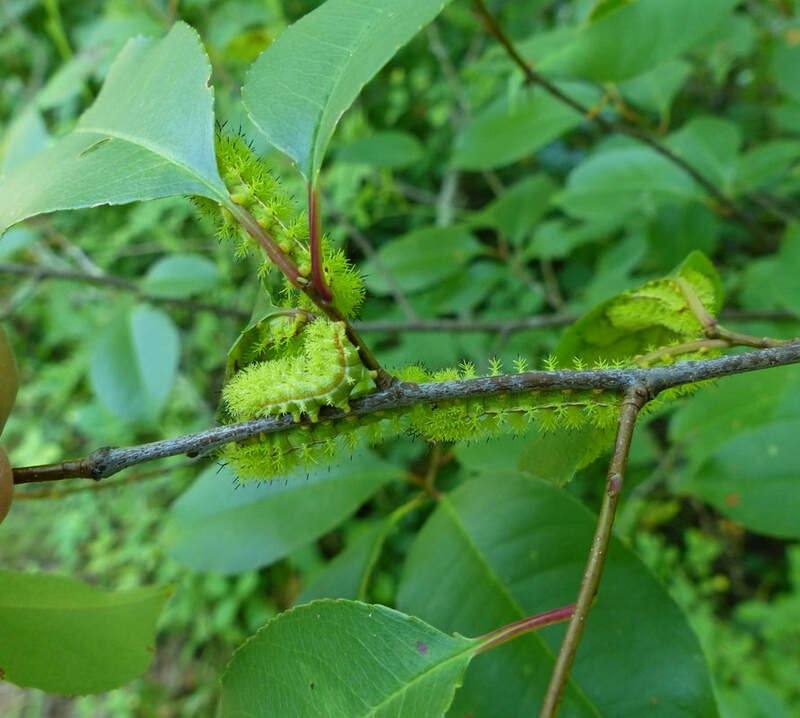 As you can see from this group of young Io Moth Caterpillars clustered on a branch of a tree, from afar, they blend in well and are successfully camouflaged as part of the foliage. Io Moth Caterpillars (Automeris io) are often ignored because they are not seen as juicy prey but as part of a plant. 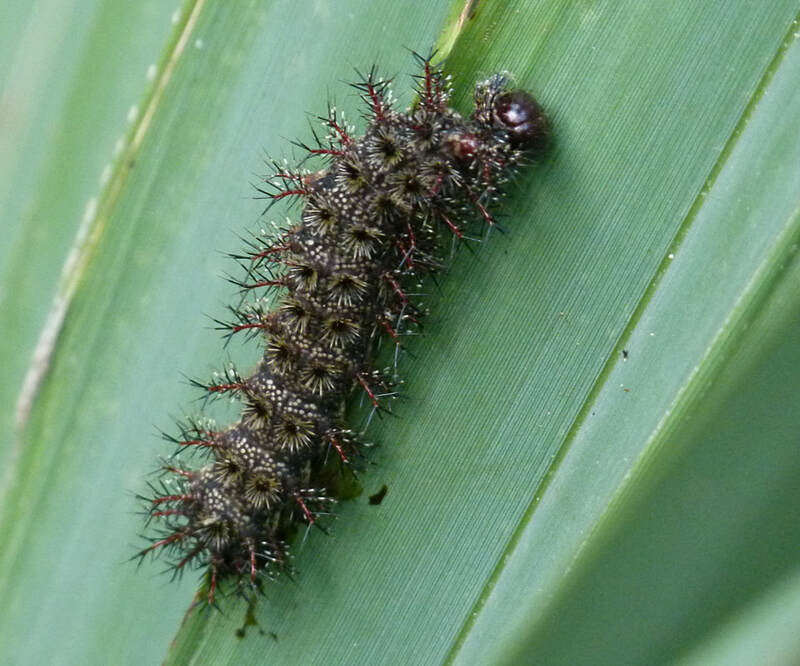 The Buck Moth Caterpillar is also covered with spiny clusters which are attached to venom glands. Its venom is potent — on the order of the Saddleback Caterpillar's. Like the Saddleback, the pain it produces is immediate, often spreading to lymphatic nodes and becoming more intense. One person reported hat touching a dead caterpillar produced a sting! It also causes a lasting welt where the spines entered. 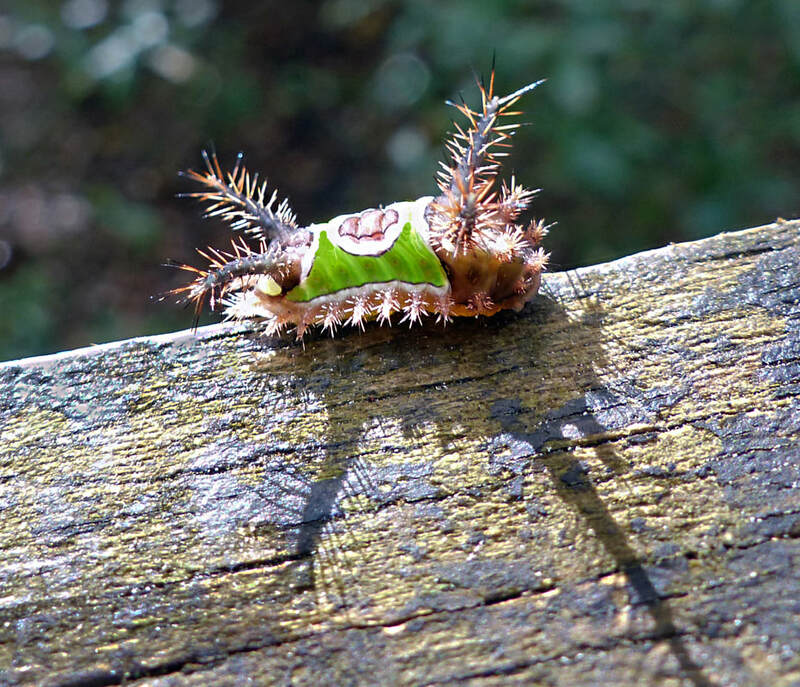 You will notice that this Buck Moth's Caterpillar's head is no longer attached. It looks as if whatever attacked it encountered some contact with the spines and thought better about pursuing its target. Contact with a Buck Moth Caterpillar can be a painful learning experience. 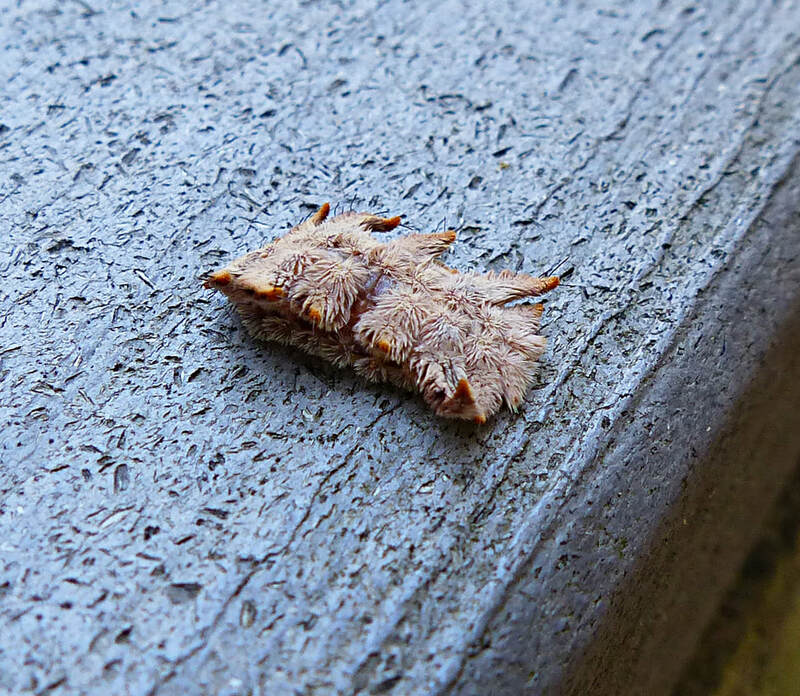 The White-Marked Tussock Moth has bright red warning markers as well as many stinging, nettling, urticaceous hairs. These hairs can cause an irritating rash in humans. Apparently, the onset of this rash is not immediate like the pain inflicted by contact with many of the caterpillars above. 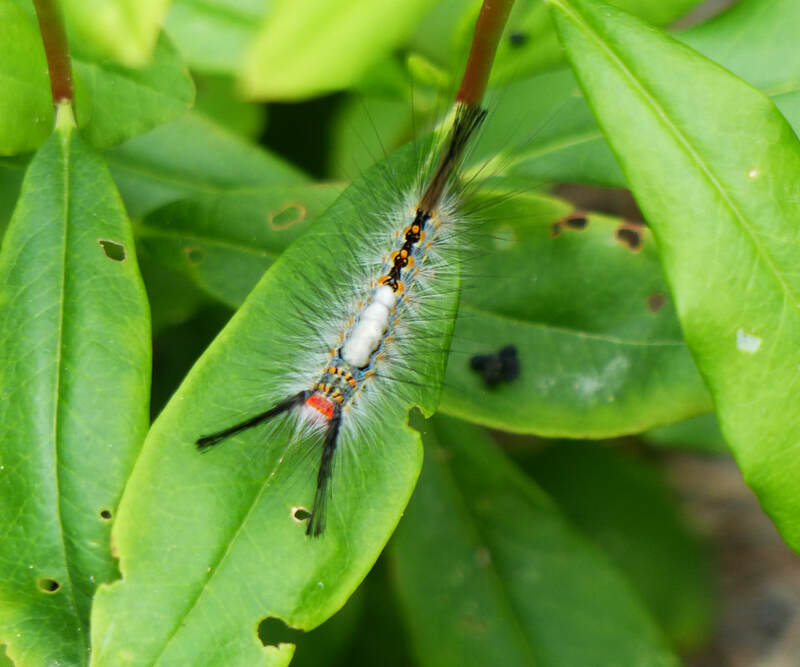 Touching a White-Marked Tussock Moth's hairs may cause a rash and irritation in minutes to hours. ​TO BE SAFE, DO NOT TOUCH OR HOLD ANY CATERPILLARS! !